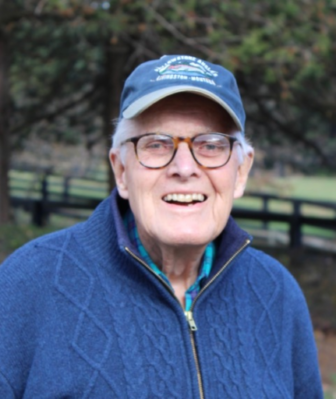 Ned Goodnow, a longtime resident of Darien who received a Purple Heart as a combat infantryman in World War II, will lead Darien’s Memorial Day parade as grand marshal. The Darien Monuments and Ceremonies Commission named Goodnow to the honor in an announcement Friday morning. Phil Kraft, executive director of the National Veterans Services Fund and chairman of the commission, was named the Memorial Day speaker. Edward B. (“Ned”) Goodnow of Darien, who earned a Purple Heart as a combat infantryman in the Battle of the Bulge during World War II, will lead the town’s Memorial Day parade as its grand marshal. Edward “Ned” Goodnow, named the 2017 Darien Memorial Day parade grand marshal. Ned Goodnow is a native of Norwich. His father died in 1932 during the depths of the Great Depression, when Ned was seven years old. Despite ensuing family financial challenges, in the fall of 1940, Ned was admitted to the Hotchkiss School on a full scholarship. As did many secondary schools, Hotchkiss operated on an accelerated schedule during World War II; Ned graduated in three years, in June 1943. He entered Princeton a week later, completed his freshman year that December and entered the United States Army the following month. After training as a rifleman, Ned shipped out to Europe with the 99th Infantry Division. The 99th arrived in France on Nov. 3, 1944, and was on the front lines in Belgium facing the German army within a week. But, green or not, in mid-December, when the Germans launched their all-out offensive to break the Allied lines, the 99th successfully held its position during the brutally cold, six-week battle. By the beginning of March, it had crossed the Rhine into Germany. After the war, Ned returned to Princeton, where he graduated in 1949. He joined the investment firm of Kidder, Peabody & Co., but was called back into the service after the outbreak of the Korean War. After training as a forward observer with the Field Artillery, he served as a first lieutenant in Germany with the 4th Infantry Division, as part of the formation of the NATO forces in Europe. After that deployment, Ned returned to Kidder, where he remained until 1969, when he cofounded Goodnow, Gray & Co., a financial firm, in Darien. Now, nearly 50 years later, Ned Goodnow continues to be active in its successor, Goodnow Investment Group LLC. Ned is an avid outdoorsman and is dedicated to the pursuit of the trout and the salmon. He and his family are longtime residents of Darien. When American flags get damaged, they're supposed to be retired — and when they're ripped, faded, tattered, torn and otherwise unsightly, it's time to dispose of them in a proper, respectful manner. So state Rep. Terrie Wood, Darien VFW Post No. Consider donating to a local Allstate agency’s Toys for Tots donation drive. All donations collected will go to local families in the community they were collected in. Darien-based National Veterans Services Fund, a four-decade-old group that helps veterans, particularly those in emergencies, announced Saturday that it's changing its name, its website and the way it raises money. The HonorBound Foundation has the new website up, although the website for the group under its old name is also still on the Web. The former name "didn't really convey the mission that we really need to convey, the mission that we really need to convey," said the organization's executive director, Phillip Kraft, who made the announcement on the morning of Veterans Day at the headquarters for the group on West Avenue.